You guys know we love us some bridal beauty around these parts. We’re extremely passionate about sharing new styles, the latest looks that are wowing us, and ofcourse the artists behind the magic! It’s just amazing to us how both hairstylists and makeup artists come up with these intricate designs and looks, and we know that you guys LOVE watching videos, tutorials and all of the possible inspiration at your disposal to help you choose the perfect looks for your events. If you think of it, we put so much effort into this category for our daily lives, that when it comes to our special day, we can’t help but be a bittttt picky…right? Trust us when we say the the professionals in this business know how you feel, and are always excited to see what ideas you are going to come up with. In fact, they definitely bank on it, but the key here is to choose the artist that you are totally comfortable with, that adores their work, and more importantly, that you can put your trust in. It isn’t easy…we know. But it’s really worth it, and that’s why today we are so honoured to introduce you to one of the very best in the business based in the beautiful Cayman Islands. Jackie Soriano caught our attention back in 2016, and from that moment, our lives have never been the same. Her style is so elegant, classy and her gift for her craft is so admirable and inspirational that we know that you lovebirds are going to be mesmerised. 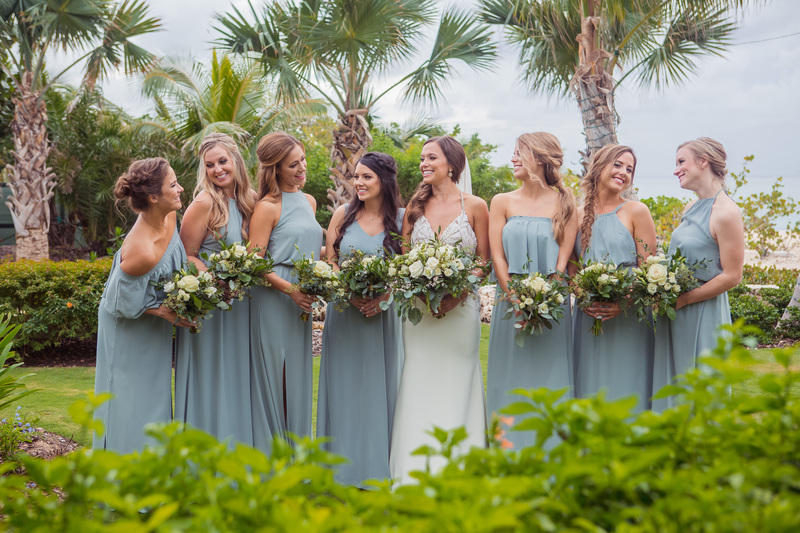 Her work has been featured in various wedding blogs and publications such as Cayman Vows, Wedding Chicks and ofcourse Adriana Weddings, and we know that you will certainly see more of her in 2019! So who’s ready to meet this lovely makeup artist and hairstylist? …We know that’s YOU darling, so keep scrolling for more! 1. What inspires your incredible designs and looks? My clients and fashion! Each individual inspires the look I create. From their facial features, skin tone, hair texture to their unique style. We usually reference some picture for a general look, but no 2 looks are ever the same. I like to take runway & editorial looks into my bridal looks. 2. What are some of your most popular looks? These images below are some of my most popular bridal hairstyles. Most weddings and events are on the beach, so I get a lot of requests for soft, tousled waves. The Caribbean is known for warm temperatures, breezy beaches and high humidity. Most brides or models battle frizz, or waves and volume dropping. My recommendation for this hair type is to create some sort of structure to the hair, whether its half up, full up do, or a loose braid to keep it from looking like a hot mess after being on the beach. Current bridal makeup looks range from super glam and bold to subtle and natural. I work with a wide range of ladies that vary in makeup styles. For my makeup lovers I go full coverage, a bold eye or lip and false lashes. For my little to no makeup wearers, I go for a “no makeup makeup” look. In both cases I focus heavily on flawless skin, glowing skin is always in! 3. 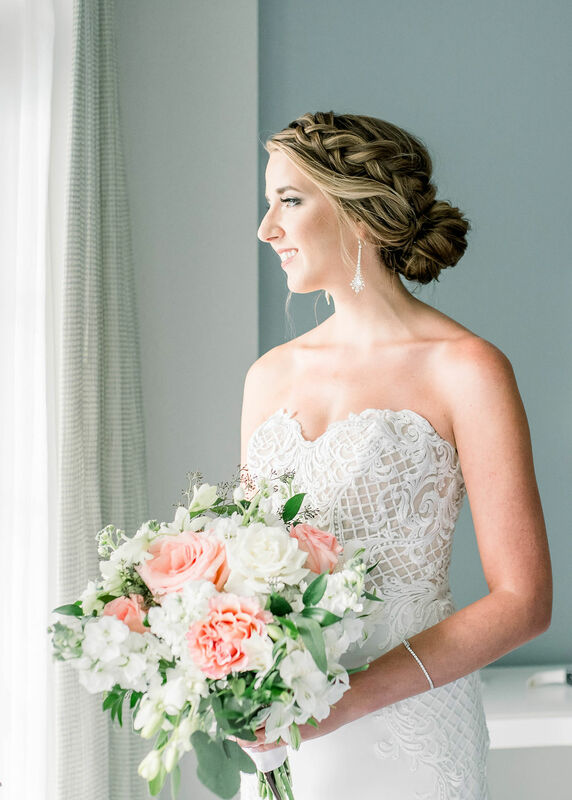 What is your favorite part of creating beautiful hairstyles and beauty looks for brides and bridesmaids? 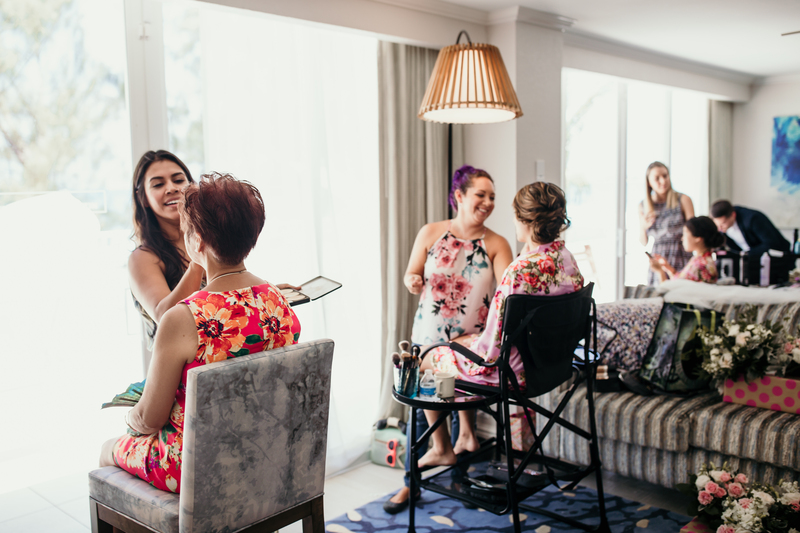 There is something about getting a group of ladies together and mix hair, makeup, flowers and pretty gowns (maybe some bubbly) and turn it into a party, it really is the party before the party. But the very best part of my job is when they say things like “ I’ve never looked or felt more beautiful”, I really love seeing someone’s confidence shine through! 4. 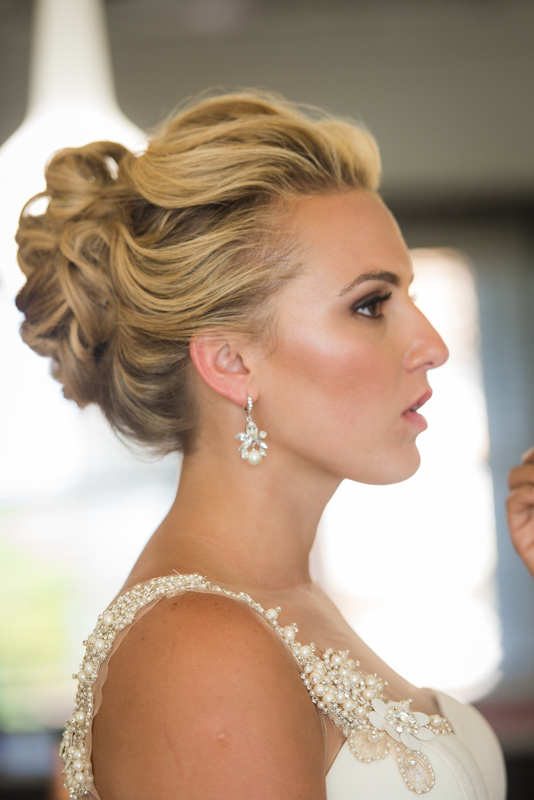 What is the most challenging part of being a wedding hair stylist & makeup artist? Not having a clone or 8 arms. The Caribbean is a booming destination wedding location and I sometimes have to turn brides away because I’m fully booked. Thankfully I work closely with a talented hair and makeup team for larger groups. 5. What was the most unique beauty request that you ever received from a bride for her wedding day? I find Indian weddings unique because it’s not something I grew up seeing. 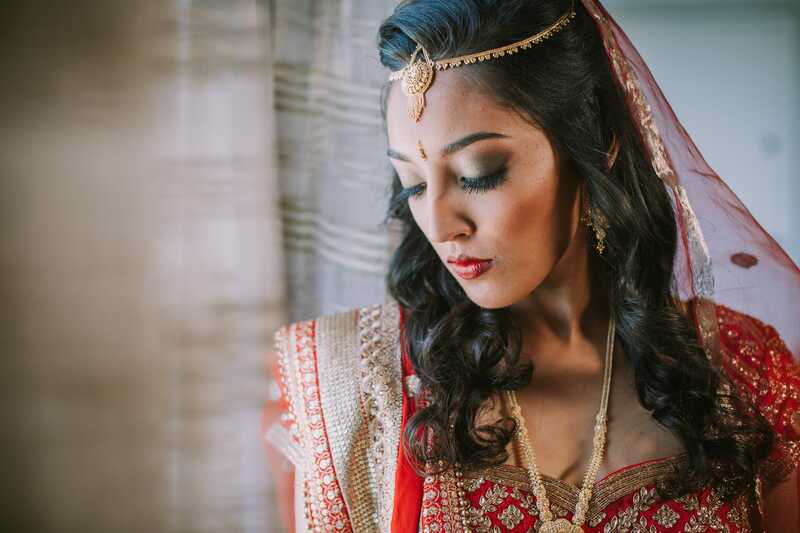 I remember my first Indian bride trusting me, and I spent days before obsessing and working on perfecting the look. It’s now my favorite styles! I have booked destination weddings in Canada and Guernsey, UK. 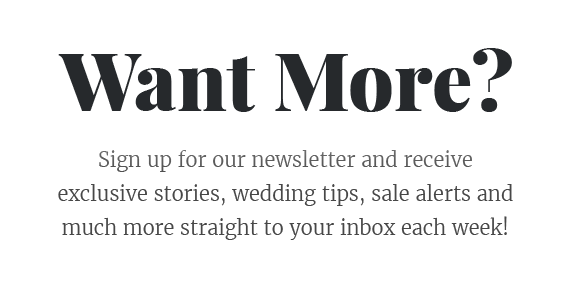 I’m so excited to see other beautiful wedding venues and collaborate with different vendors. I love traveling for weddings! 7. Do you have any recommendations for brides when they are looking for their dream hair stylist & makeup artist? That’s a great question! I think it’s really important to feel comfortable and confident with your stylist – you have to click! Check out their profiles, websites and images. I highly recommend a hair and makeup trial (ideally) a month before the big day. Find photos of styles and looks you like as a visual guide. The stylist will have a better understanding epically if hair and makeup is not your area of expertise. It’s also important to point out what you don’t like. 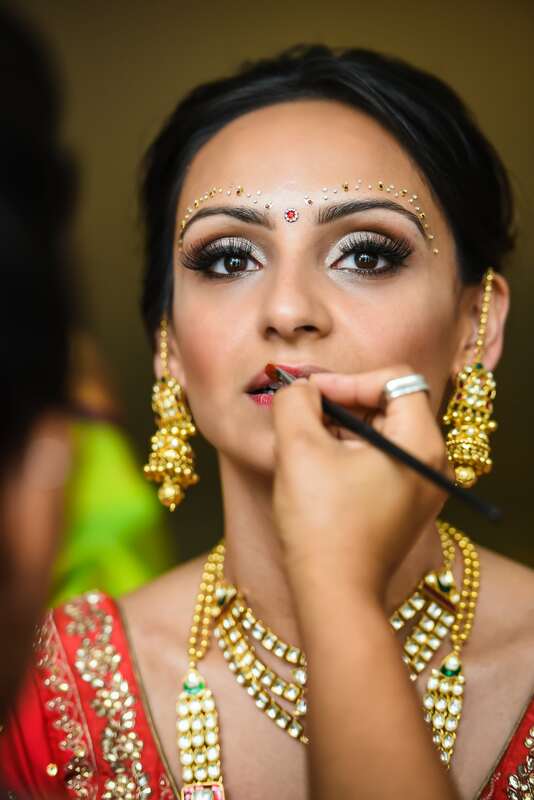 Hair and makeup styling on your wedding day is going to set the tone of how you look and feel on your special day. Choose what you feel most beautiful in and don’t let others tell you otherwise, It’s YOUR day. If you ever have questions or need advice contact me at info@jackiesoriano.com. For more information or to make an enquiry with Jackie Soriano Hair & Makeup, head over to her website now. Get some sweet inspiration from Destination Wedding Photographer Amber Dawn Photography HERE.